A recent Microsoft security update may impact your ability to add new network printers to L&S PCs; L&S Macs are unaffected by these issues. Campus IT staff are working to resolve the problem, but some isolated issues may persist through the first few weeks of the school year. Up until now, UWM has been customizing its print drivers for RICOH printers and copiers. The customizations create a “pop-up” dialog that enables you to enter your print codes each time you send a print job. Customizing the driver removes the “digital signature” from RICOH that certifies the driver is safe. After a recent update to Windows, it is no longer possible to install drivers without a valid digital signature. The result: New and recently re-imaged PCs have no way of printing to affected printers. As computers are replaced, the problem will impact more and more workstations. To resolve the issue, UWM will begin using official, un-modified drivers directly from RICOH. In some cases, new network printing queues will have to be created using standard drivers. 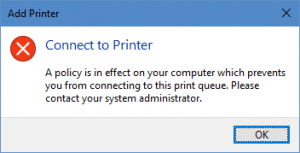 New or updated print queues will automatically be added to LSITO-supported computers. New OneDrive for Business Client Available!